In Ayurveda, a balanced diet plays a fundamental role in the maintenance of health. Ayurveda further supports our nutrition with a variety of herbal and mineral food supplements (Rasayanas). These ancient and sophisticated herbal and mineral preparations support health in many ways. According to Ayurveda, they function to restore the body’s inner intelligence, thereby creating harmony and balance. 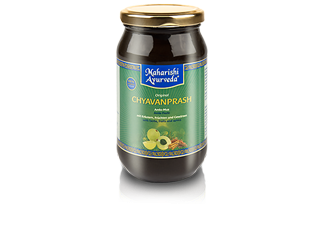 Maharishi Ayurveda food supplements are exclusively prepared according to age-old, original Ayurvedic formulas. We take pride in faithfully maintaining all the traditional manufacturing steps – which are sometimes sophisticated – in order to guarantee the outstanding quality of our products. In addition, the entire production process is monitored by experienced Vaidyas (Ayurvedic scholars). The highest quality standards for your well-being: trust and security through first class, certified Ayurvedic products from original recipes. Our authentic Ayurvedic products are tested in independent laboratories to ensure they meet the most recent European standards.